I like it. It adds a colored texture to the light background – almost like adding a print design to the fabric. I like that it also adds a feeling of informal fun and cheer to my piece. Will I do it again? Answer is yes, when the project calls for it. 1. Be very familiar with the flow of the feathers, especially if they are being free-handed. Any jerky stops along the way WILL show up much more visibly. Having a good flow of things will definitely minimize that problem. Have you read my post on the essentials of good feathers here? 2. Since it is not very forgiving visually to quilt a contrasting thread on a light background, I changed out my needles whenever I was in doubt about the stitch quality. I can see that the stitch quality was preserved that way. I have posted my thoughts about needles here. 3. I needed extra concentration and focus to keep things going. If you look at the picture more closely, any bumps you see were resulted from me not paying 150% attention. As a result, I took more breaks quilting this piece. That’s all, folks! I would love to hear what you are thinking. This entry was posted in Quilting, Thread Talk and tagged Feather quilting, Free-motion quilting. Bookmark the permalink. What I think issssssssss it’s gorgeous! Great post Wendy – I am still fascinated with feathers and have started using the ‘bump bump ‘ method ( I heard Karen Mc Tavish caling it that) which is the same as yours. Finding that my feathers have a smoother flow to them. Your feathers are fabulous – as ever. Enjoy your day. Rhianon. It is a brave move, but one one that you have pulled off, the feathers look fabulous. I am in the middle of my very first ever quilt!!! I am terrified of what to do with it when it is made up. i look at your fabulous stitching and think “How on earth am I going to do that with my very (very good) but very small sewing machine. How do you stitch a pattern over a larg quilt. I think I am going to just “stitch in the ditch” for the first few times. Boring but safer! Anne Marie…go for it! You will be surprised at how well you do. Wendy, lovely feathers. The only feathers I have done are marked. but I am going to go the next step, too. I was really glad to read your article on needles. I have never changed them that often but will start now. Your work is so beautiful. Do you have a video or have you done anything on you tube? Your work is great! Thank you so much for sharing your tips and links – I’m going to be trying feathers on my next charity quilt. Boy, they freak me out for some reason! But I love them, so I gotta get past this and start doing them!! Anne Marie, As donna j encouraged, just ‘go for it’. Do a practice piece using the elements in the quilt. Experiment on a simple design and then start the quilt in an area that is less focal, if possible. After you are at it for a while you will be amazed at how you have progressed in your ability. 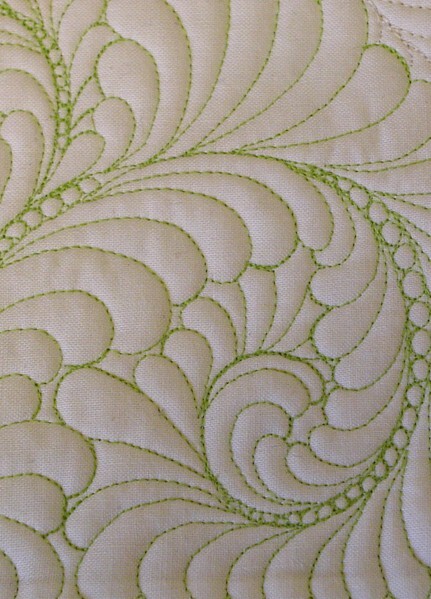 This is one of those skills that can only be mastered by doing and, sometimes, that means on the quilt itself. When working on my practice piece, I know it’s not the quilt and am relaxed. I begin the actual quilt and my MIND seizes and I tense. Focus is key, relaxing is uber important (back off on the caffeine? Soft music, sip of wine??) and have fun. It really isn’t “rocket science”. I am far from having ‘arrived’ but am definitely at the ‘this is so much fun’ stage!!!!! Track back on Wendy’s posts. She is right on target with her advice/suggestions. Most of all…..enjoy the process/journey there are many along with you! Well as much as I tried doing feathers there is the art factor. If you can’t draw worth a darn lol you will never get them as gorgeous as you. You sure are an inspiration though. I sure appreciate all of the tips. thanks for those tips. I will be definitely sticking with matching thread for a while. I went back to read about the needles. Thanks for those tips too. I am doing the SewCalChallenge and one lady recommends using a top stitch needle. I bought some but have not tried them. I have always used the quilting needles. Your work is so beautiful and I love the colored thread look! Perfect feathers! Well all your tips sure worked for you, this is amazing. All I see is perfection! I may never be daring enough to try quilting feathers in a contrasting color, but I love how they look. The advice about the needles is really appreciated. Sometimes I get so busy with sewing, I forget to change my needle until there is a problem. I’m trying to remember to change them more often. It all looks pretty fantastic to me. I don’t notice any imperfections!